I like Jeffrey Archer. Whenever I see his face in the newspapers, he gives me the impression of a very smart businessman who's eager to share his best-learnt skills. 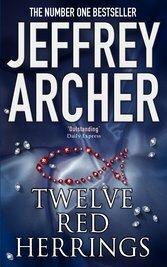 Jeffrey Archer was one of the first writers I always admired when writing stories. A part of my writing style matured as I read his stories. I bought this book when I was in my second year of college. I remember buying this book on Amazon perhaps a week before my semester results were out. The day when my results were out, I saw two big "U" in the result portal. Holy crap, I flunked in two subjects. That day, I remember reading the 12 red herrings with a heavy heart. Well, I'm a writer, if I am stressed, reading a book helps me see the light in a sea of darkness. Now let's come to the actual reviewing. It's about a wrongly convicted imprisoned man who is very certain that his supposed murder victim is very much alive. The story was long and fine. The narrative phase was a wee bit slow but the backstory of how the lead character spent his days before being forced into jail was really nice to read. There's a courtroom scene which felt like reading a very great film script. it's about an Iraqi refugee who escaped from his homeland to live a better life in the united states. When he's on his way to Turkey to buy carpets — he's a carpet merchant by the way — his flight involuntary lands in Iraq. That's when the story rushes up like a light. The hero is on the death list of Saddam Hussain and he's spotted by one of the former military generals. It is a very great suspense story. 3. Never stop on the motorway. It is another story of a woman who's on her way to visit her friend. She's chased suddenly by a mysterious driver. The entire story happens within the confines of the car yet the author so effortlessly says the backstory with ease. Painter Sally who starts a relationship with a man. This is a story of betrayal and how hard work helps you find your success. Now, this is a story worth reading over and over. Here, you decide about the ending. Jeffrey Archer writes a prologue where the character — it's a first-person story — sees a girl heading into a movie theatre. Boy heads into a theatre, buy himself a ticket and finds time to talk to the girl. He then asks her out for dinner. Her response is said in four different perspectives. You get to decide what happened to the characters. The story is so ingenious and I have never ever come across a story with an ending that's decided by us — the readers. The other stories were good but I didn't find them as engaging as the ones I have told you about. There was a lot of drag and I somewhat felt vacant as I read the other stories. The writer also claims in the index page that some of the stories are based on known incidents. Now, that's really cool.